We love Chicken and Vegetable Soup – any time of the year! Fall is finally here in Texas and so it’s a great time to roll out those comforting, hot soup recipes everyone loves this time of year. 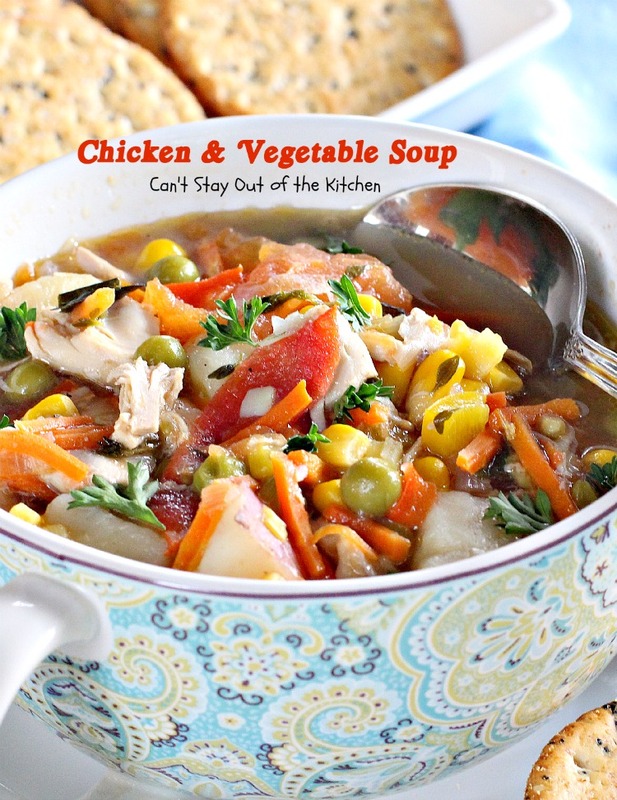 Chicken and Vegetable Soup is a delicious concoction filled with lots of great garden veggies and is extremely low calorie, gluten free and healthy. It’s also dairy free. I made this soup a couple of weeks ago when I was wanting hot lunch meals rather than salads or sandwiches and it really hit the spot. 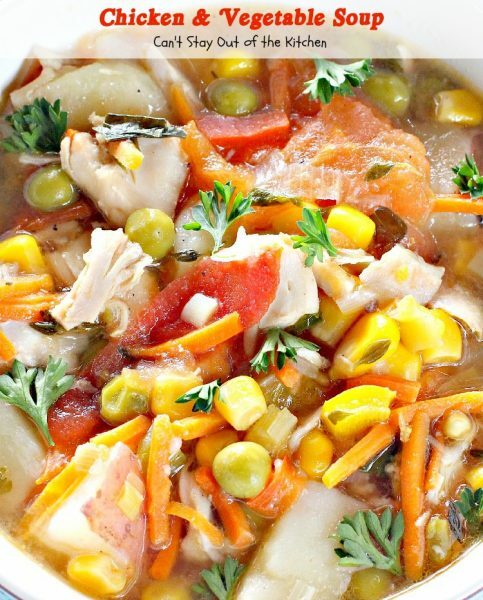 I’ve flavored this soup with four different fresh herbs that provide wonderful flavor. While I used the convenience of a rotisserie chicken and chicken broth, you can easily cook off your own chicken and make your own chicken broth for this recipe too. This soup is pretty easy and no reason why you couldn’t pile all the ingredients in a crockpot to cook it up too. I was wanting a meal a little sooner and didn’t want to wait four or five hours which is the only reason I didn’t use my crockpot on this recipe. 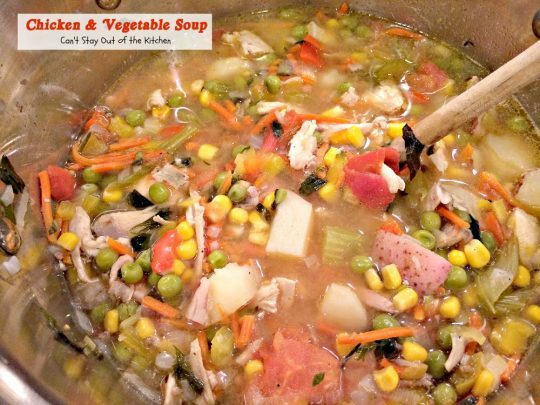 For those who have a garden this is a great soup to make up anytime of the year–especially if you want to use up peas, carrots, potatoes, celery, onions, bell peppers, or corn. I add leeks to this soup which add an awesome flavor and texture to the soup. If you’ve never cooked with leeks before you don’t know what your missing. They are wonderful! Anyway, the flavors in this soup can’t be beat, and if you want a vegan version then eliminate the meat and use vegetable broth instead. I thought Chicken and Vegetable Soup turned out marvelous with the chicken added to it, and this would also be a fantastic way to use up leftover Thanksgiving turkey and broth, too! If you’re looking for an extremely tasty soup recipe that’s healthy, really low in calories, gluten and dairy free, then consider this Chicken and Vegetable Soup the next time you want to make up something warm and comforting on a cold winter night. It’s really not all that difficult, though it does take a few minutes to chop up the veggies and pull the chicken off the bone. For a savory, flavorful soup you’re whole family will enjoy (and you can eat as much of it as you want! 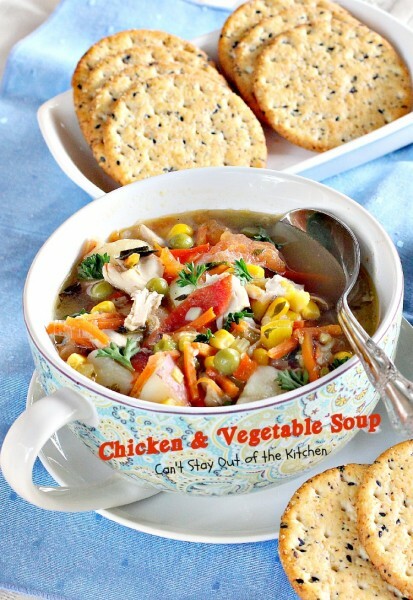 ), then try a cup, or two, or three, or four…..you get it, of this lovely soup. Yum. 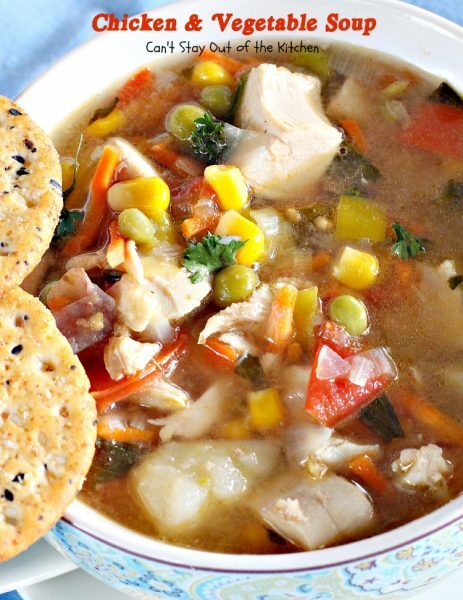 Chicken and Vegetable Soup is a savory, flavorful soup that you’re whole family will enjoy during these cool fall nights! 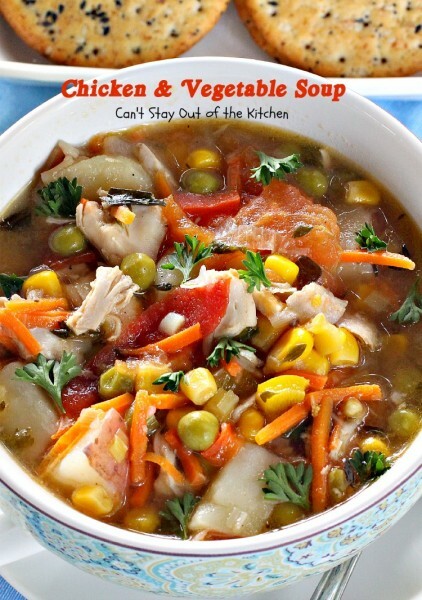 Chicken and Vegetable Soup is healthy, very low calorie, dairy and gluten free. While I made this recipe on top of the stove, you could just as easily throw everything in the crockpot and cook it that way, too. 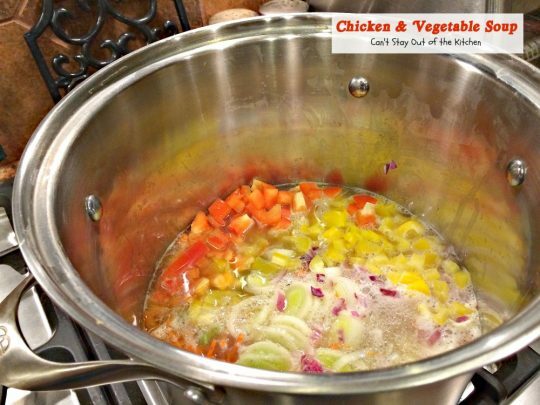 Pour chicken broth into a large stockpot and place over medium to medium-high heat. Add matchstix carrots, celery diced on the diagonal, one sliced leek (discard the top and clean really well), diced yellow bell pepper, diced red onion and diced red bell pepper. Add red potatoes cut in chunks, roma tomatoes sliced in 1/2-inch slices and peas. Season with fresh parsley, rosemary, thyme, basil, salt and pepper. Add leftover rotisserie chicken cut in small chunks. Add corn. I didn’t have any fresh or frozen corn so I used canned instead. Stir to combine. Simmer about 20-30 minutes until vegetables (especially the potatoes) are cooked through. If necessary, add more broth or water. I didn’t need any. Serve with crackers, gluten free crackers or one of my favorites: Pumpkin Pie Biscuits! To serve: Ladle soup into soup bowls and garnish with fresh parsley. 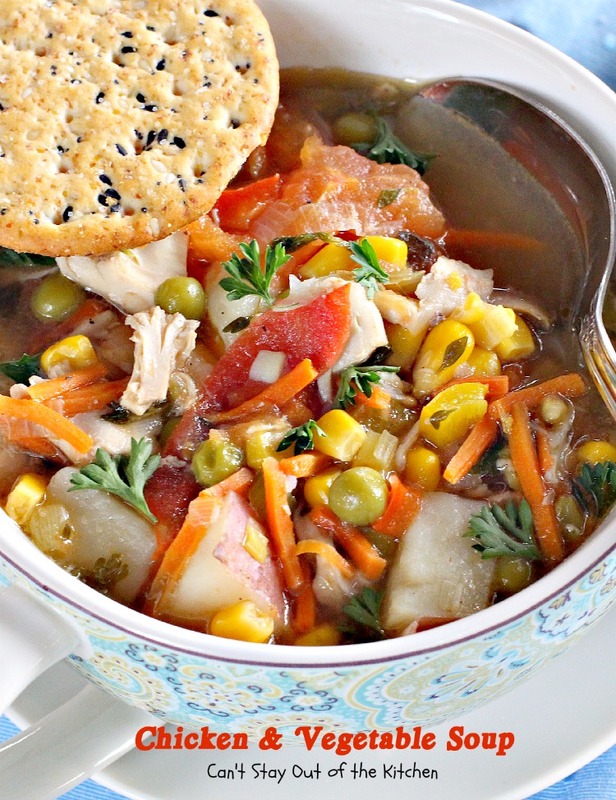 This lovely soup is chocked full of veggies and flavor. One of the nice things about this soup is it is really low calorie since the base is not made with dairy. 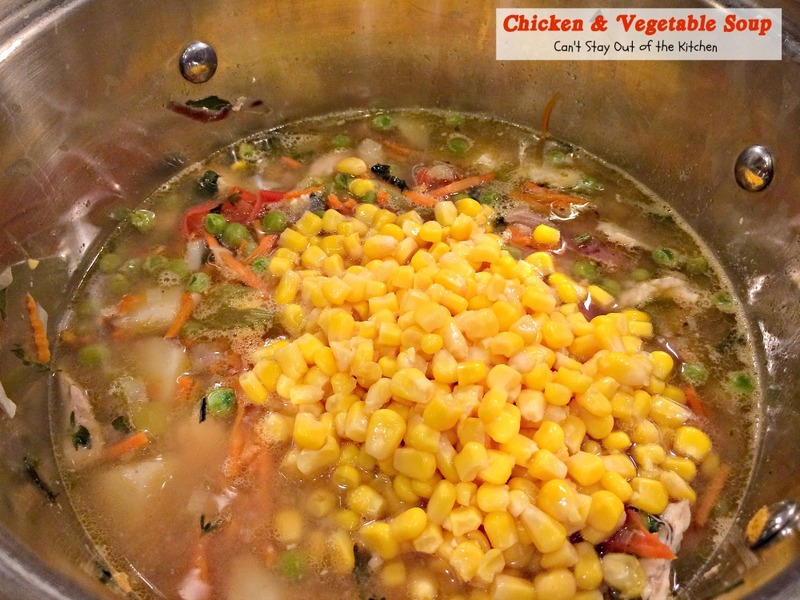 Chicken soup with tomatoes, corn, celery, leeks, onions,peas, carrots, bell peppers, red potatoes with lots of fresh spices to provide flavor. Gluten free. Cook off a whole chicken and debone, reserving chicken broth. 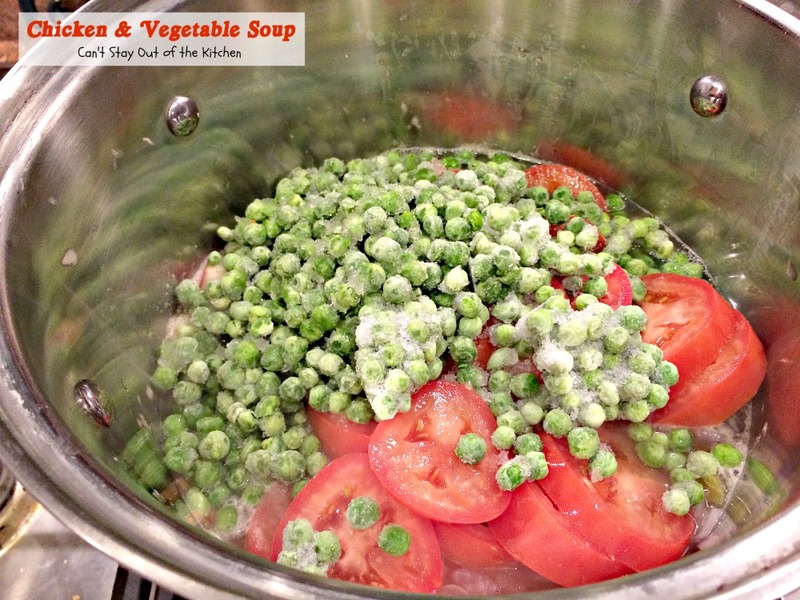 Add carrots, celery, onions, bell peppers, potatoes, tomatoes, and peas. Add parsley, rosemary, thyme, basil and salt. Simmer mixture about 20-30 minutes or until veggies are tender. 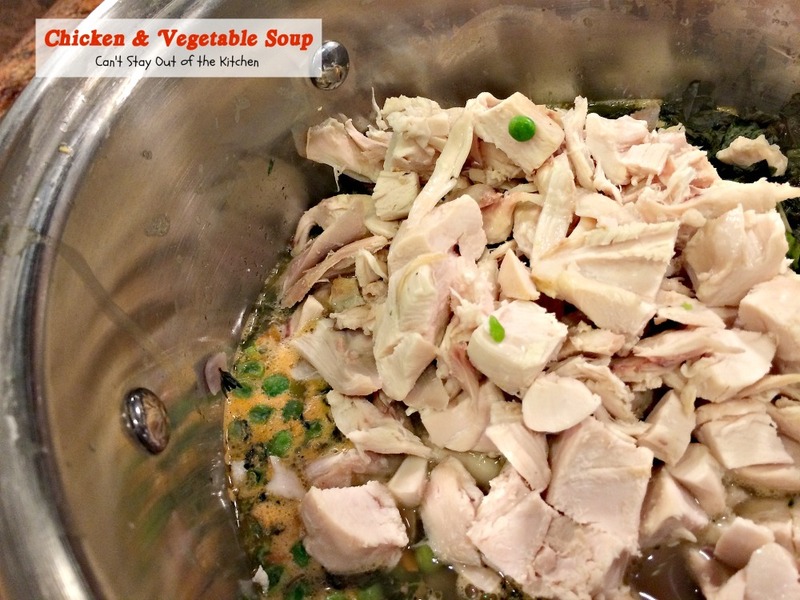 This is a great way to use up leftover turkey and turkey broth if you desire! Aren’t you ready to dig in to this terrific soup? 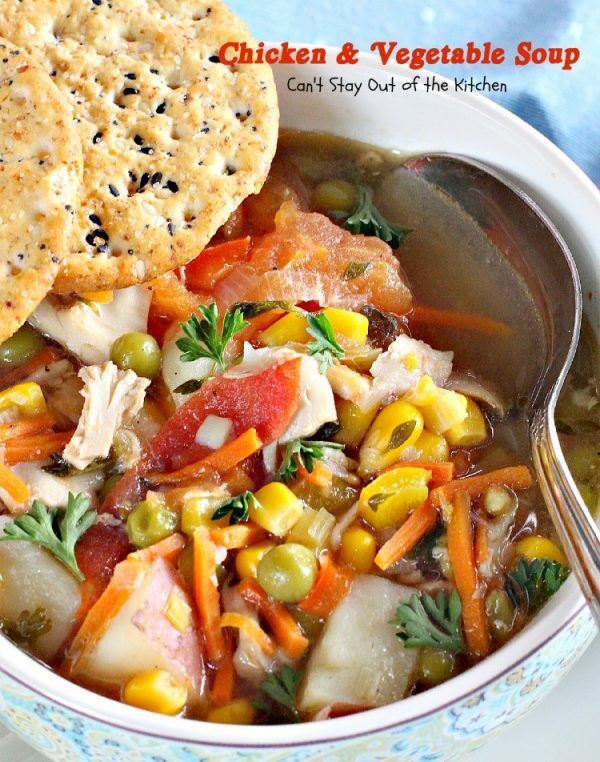 Chicken and Vegetable Soup isn’t too difficult to make and it’s a great way to use up leftovers and make sure your family eats their veggies! Thanks, Tamara. It was pretty tasty.